My first 2 posts were on SharePoint so I decided to dedicate next couple of posts to cycling. To begin, let's talk about the bikes themselves. To date I have 6 bikes total, 2 road bikes, a 29er for the mountains, a commuter for work, a fixie for around town, and an old mountain bike that I use mostly as a loaner. I don't have a favorite per se, I just choose whichever one is best suited for the ride that day. I ended up with 2 road bikes this year because I decided to upgrade towards the end of the season. I started out the year with a Felt Z90 that is a great bike for an entry level bike. I put in a boat load of miles on it throughout the summer training for LOTOJA which I will do a blog on in the coming days. ﻿﻿﻿﻿﻿﻿﻿﻿The 2009 Felt Z90 was my first road bike. I bought it originally to commute to work as my other bike at that point was a mountain bike which at the time was still in Montana and I was in Utah. I haven't modified it much, I changed the saddle from the stock to a Serfas because it was much more comfortable, swapped out the pedals for Crank Brothers Candy and added a Cateye Strada Cadence computer. Now I use this bike on my trainer in the winter and the 700x25 tires come in handy for those questionable weather rides such as the FrontRunner Centruy in early April and the Bike the Bear ride in August. I will be posting blogs for those rides in the next day or two as well. I picked up this beauty on Labor Day this year. I was in the Logan, UT area scouting the course for my leg of LOTOJA when I saw that there was a sale at the bike shop in town. I stopped by to check things out and saw 2 bikes that looked to be my size. Sitting side by side was this bike and a Trek Madone 4.x and they were both my size, 61cm and 62cm respectively. I am 6'5" and finding 2 bikes in my size was indeed a treat as it is very rare for me to be able to walk into a shop and be able to test ride a bike on the spot. I had been toying with the idea of upgrading to a carbon frame but not having ever ridden one I couldn't really justify the expense. So here was my chance not to try just one carbon bike but two! I walked over to the bikes and started looking them over. I picked up the Specialized first and oh my, I couldn't get over how light it was! The I lifted the Trek and the same thing. I decided to try the Specialized first so I took it up to one of the sales clerks and asked if I could take it out for a spin. I gave him my license and off I went. As I headed out of the parking lot and onto the road awesome is the first word that comes to mind. The heavens opened up and the angels started singing. This was my Excalabur! I raced down the road and my body seemed to become one with the bike. I turned right and had a slight climb ahead. I stood up and began to really crank to see what she had in her and I noticed that it immediately lunged forward, accellerating much more quickly than I had on my Felt. The responsiveness was amazing! I kept pedaling up the hill and before I knew it I was up and over. I was in flip flops so I didn't do anything too crazy on the ride but I did manage to go out and back for about a mile or so. Right then and there I knew that I would be upgrading to a carbon frame bike. I was eager to get back to the shop to try out the Trek. I went on the same route as before and the Trek performed great. 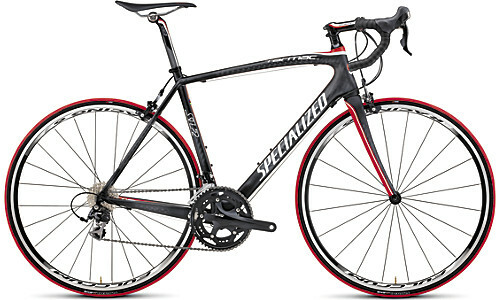 However the geometry of the bike just didn't fit me as well as the Specialized did. The heavens may have opened but the angels didn't sing and I did not become one with the bike. The Trek was a fine bike, it just wasn't the one for me. I got back to the shop and the salesman asked me what I thought. I told him that I preferred the Specialized but I wasn't sure if I was ready to buy. At this point I had only seen the regular price and I knew that I would have a tough time getting that purchase OK'd by my wife. He then mentioned that during the sale it was 45% off. After doing some math in my head I figured that it still might be tough to get the OK but not impossible. Besides, it's easier to ask for forgiveness than permission right? (If my kids are reading this then disregard that last sentence, I'm not the forgiving type.) Just kidding.... but I would be lying if I said that didn't enter into my mind. I tell the clerk that I'll take it! He takes me and the bike up to the register, hands the bike to one of the guys in the shop to give it the once over and rings me up. He mentions that they are throwing in a free jersey with every purchase but the biggest that they have is a large and I wear an XL. I take it anyways, I figure that it might fit my wife or my son will grow into it soon. As I am signing the receipt I remembered that I had driven my wife's car that day and it didn't have a rack. I know, who in their right mind drives a car without a bike rack? Luckily the bike was light enough to manuever into the back seat once the front wheel was removed. Now I had a 45 minute drive back home, long enough I thought, to formulate a plan for damage control for when my wife finds out that I bought another bike. I was thinking that I was going to have to crash on some couches for a couple of nights until things cooled down. As I arrived home I still hadn't come up with a good plan so I decided to just wing it. I pulled into the garage and got the bike out of the car. Then I headed inside carrying the bag with the free jersey and a couple of water bottles and there was my wife sitting at her computer. She asked me what was in the bag and I pulled out the jersey and told her that I got a jersey for her. She asked how much it cost and I said "the jersey was free...". She immediately knew something was up and when I saw the look on her face I immediately went through the mental roledex to try and figure out sleeping arrangements for that night. "I bought a new bike" I said. So one thing that I hadn't mentioned is that I had bought my fixie just a few short weeks before this one so I am sure that she was not thrilled to hear that I bought another bike. We had also just bought her a new road bike a couple of weeks before that so I am sure that she thought that we were done buying bikes for a while. I told her how things went down, including the part about the heavens and angels. She didn't have the same look on her face but she didn't have her happy face on either. I held out my hand and said, "come take a look at it" and she took my hand and we headed out to the garage. My son just got into biking this year too, he is 11 and told me that for his b-day he wanted a road bike. That was a very proud day for me indeed, and sure enough he got a bike for his b-day. Once he heard that Dad had a new bike he raced out to the garage ahead of us. When my wife and I got out there he was lifting it up with a look of amazement. "It's so light" he said. I guided my wife ove to the bike and said, "try lifting it". She too was amazed at the difference in weight. It was at that moment that I knew that I was going to be sleeping in my own bed that night. I could tell that she still wasn't overly thrilled but she was OK with it. I think that this was also the moment that she realized that I have an addiciton to cycling and that the best way to deal with it is to accept it. I have only put on a few hundred miles onto the Specialized but so far I am loving it. As I mentioned before I will be posting more on some of the rides that I did this summer in the next few days.